Melt 1 tablespoon of butter in a skillet that is big enough to hold the flank steak. Put the flank steak in the skillet, and cook over medium-high heat until it is browned on the outside but still pink in the center. Melt the remaining 3 tablespoons of butter in the pan drippings. Saute the mushrooms until they have shrunk to about 2/3 their original size. Slice the flank steak across the grain. 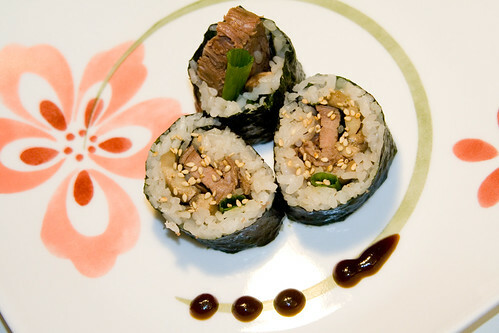 Roll the sushi, using a couple of strips of flank steak, mushrooms, and a stalk of green onion as your fillings. Serve with hoisin sauce. Enjoy! Very inventive. I always love to see what you’re making. Oh my gosh – that looks delish!!! Wow, what a cool idea. My wife is not too jazzed about sushi, but I know she’ll like this. I’ll make this week sometime. Robb – Awesome! See? 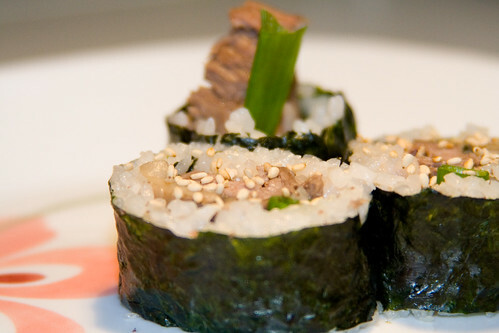 There’s even sushi for people who hate sushi! Yay! 😀 Thanks! Hadn’t thought of that… thanks! 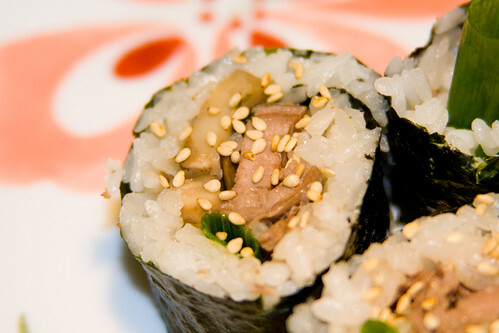 I love making sushi, but haven’t yet acquired the taste for raw fish. I make it with chicken or steak and sometimes bacon or vegetarian. If this interests anyone, I find that if you cook chicken or steak with Kikkoman Toasted Sesame Marinade it works great. 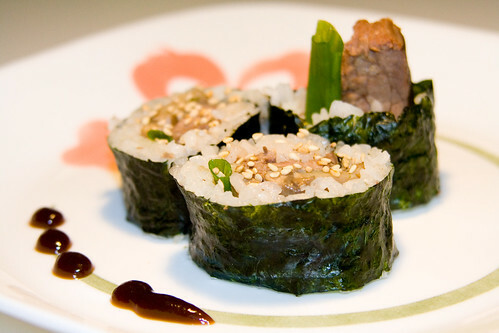 I’ve also toyed with the idea of using a sushi press to make sushi with carpaccio on top. Instead of string cheese or cream cheese I’ve used Havarti which has worked out great. It’s cream like cream cheese, but holds its structure more when you’re cutting it into strips and it’s more (and differently) flavorful.